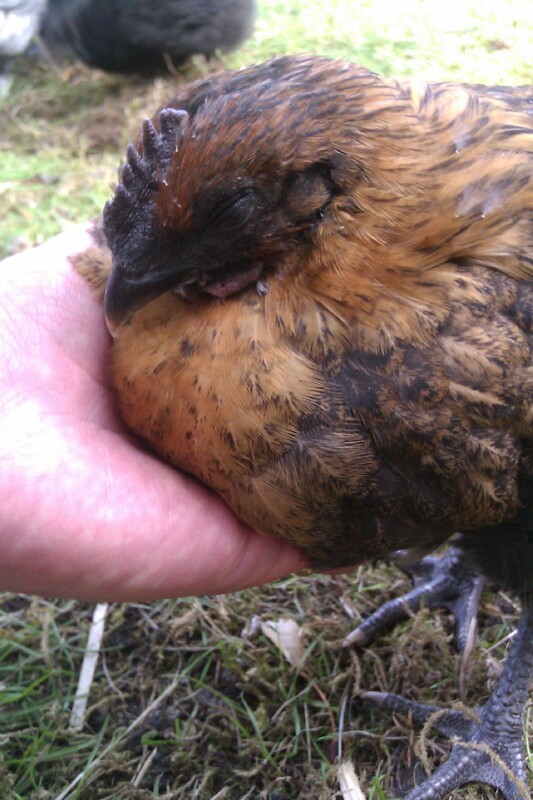 Aaaaw…I made Wasabi fall asleep in my hand! He’s the tamest of them. After the others saw him they all came over to get the same treatment. I let their feet touch the ground, one hand under the chest and stroke the back until they go heavier, relax and fall asleep. 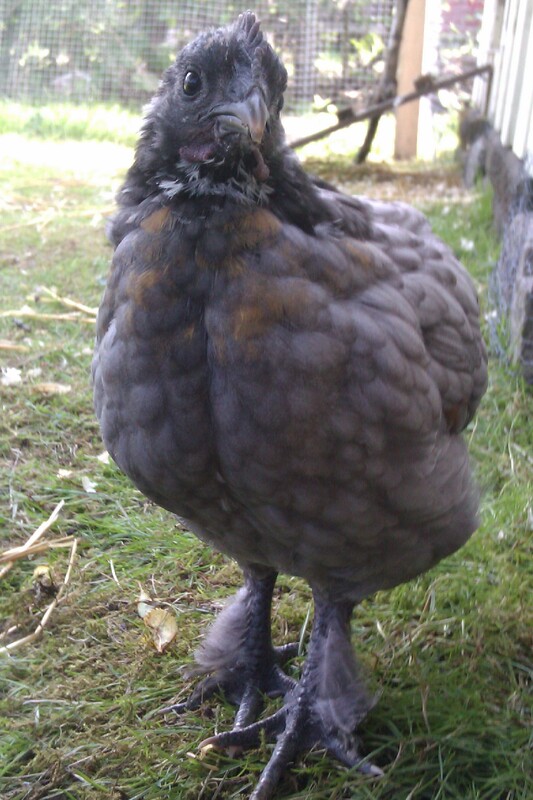 I can’t help toying with the idea of keeping one of the cockerels, of course it would be Wasabi but McGyver is very handsome to. 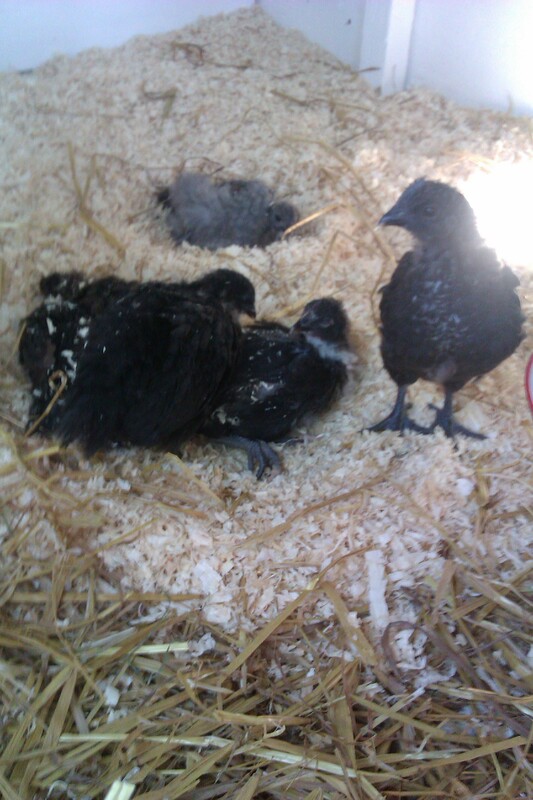 Priscilla is lowest in the pecking order, he’s always the one left out. 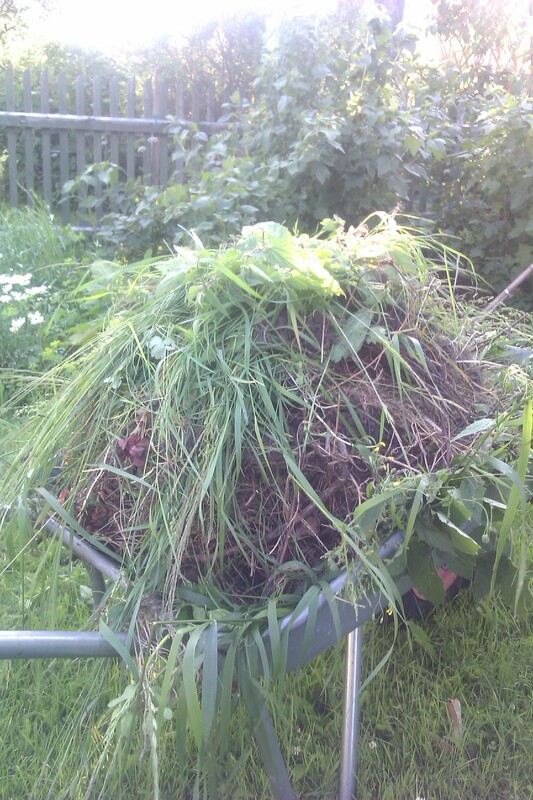 They where all in one big pile stretching out in the sun today apart from Scilla who was on his own. He’s got pretty scary yellow eyes though. 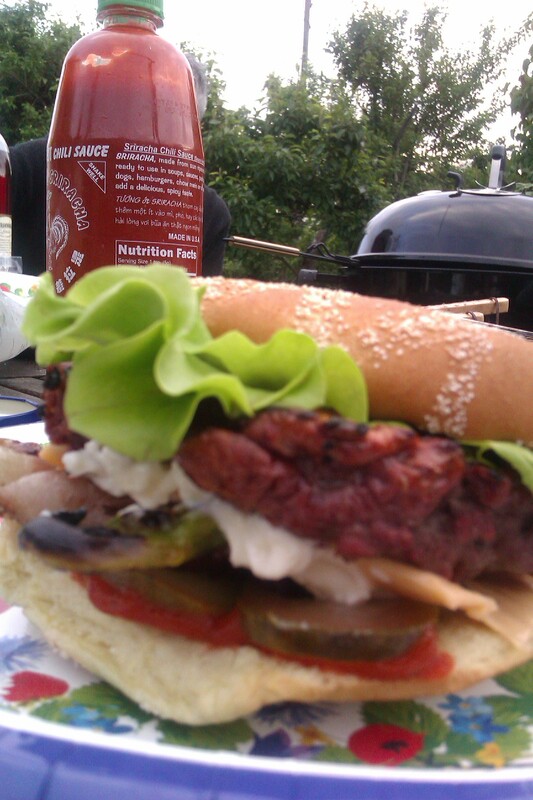 Barbecued bacon, charred chili, gherkins, cheese, lettuce, mayo, ground meat and the best chili sauce. Can’t get any better. The garden has fallen waaay behind with all other projects but today I dove in to save the strawberries. First strawberry of the year! 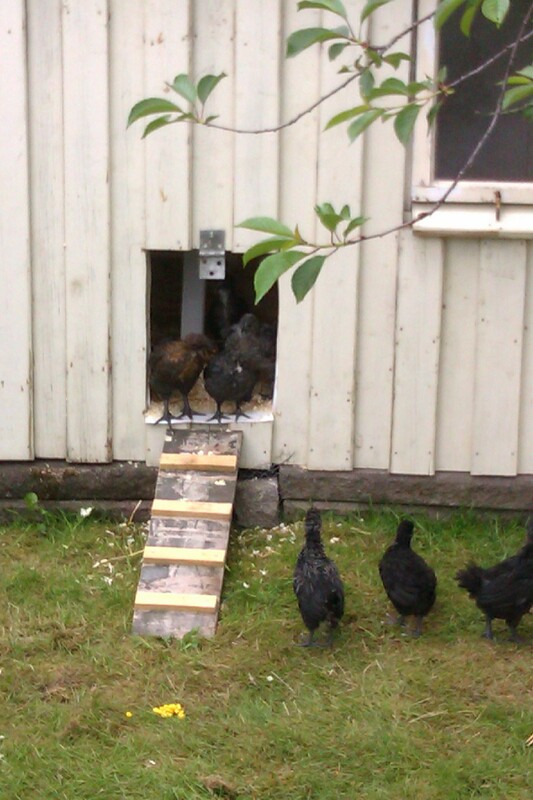 It’s even more fun now when I can watch the chickens while working. 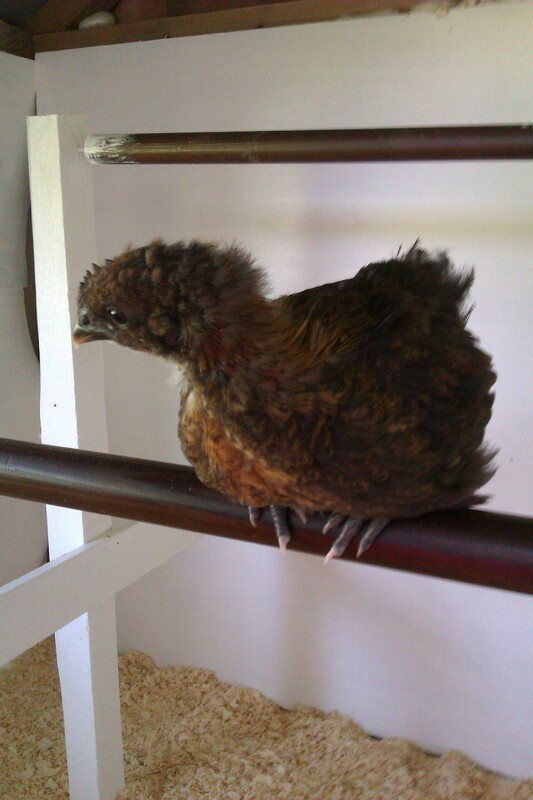 In the pen I bent down to pick one up and Ninja jumped up on my back! They now eat pretty much anything they are given or whatever they can find outside. 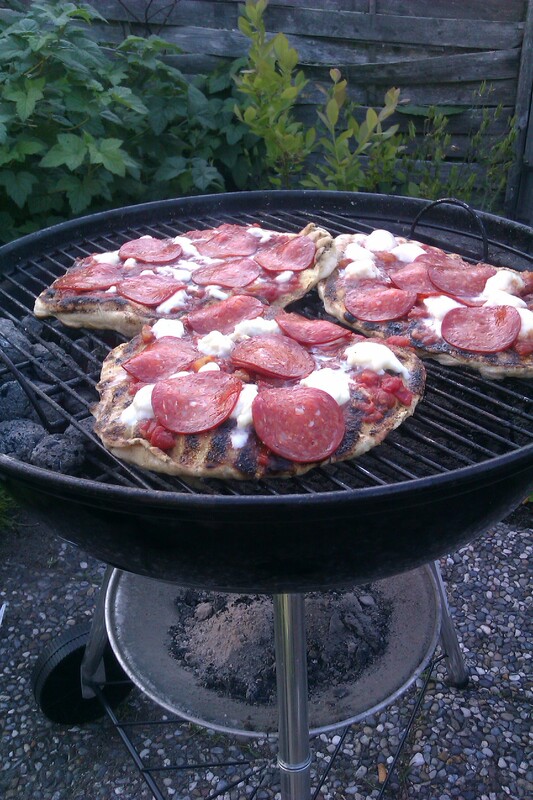 for barbeque pizza. I’m so happy I got married Friday! Best advice ever, marry I guy who loves cooking. 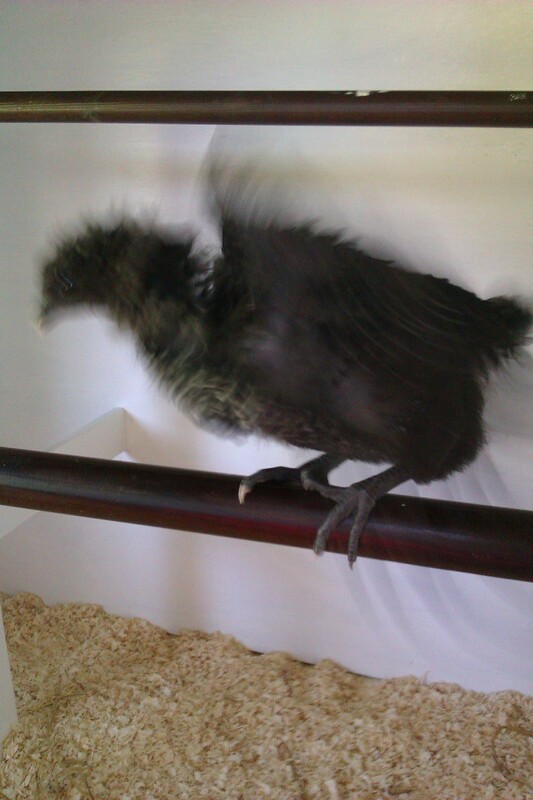 Now the chickens are running and flying around all over the place. They’ve started digging in one corner, don’t know if it’s for worms or if they are planning an escape tunnel. 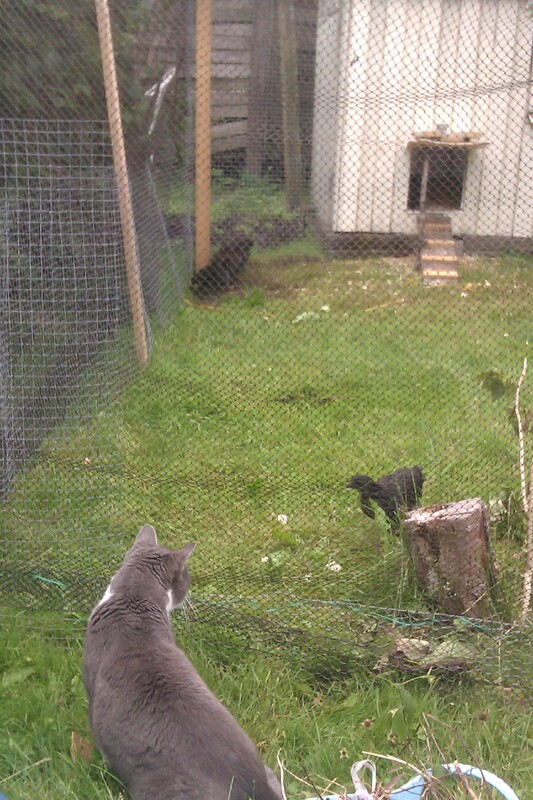 Both our cats have been circling them all day and the chickens challenge them to staring-out competitions and charging them with flapping wings. 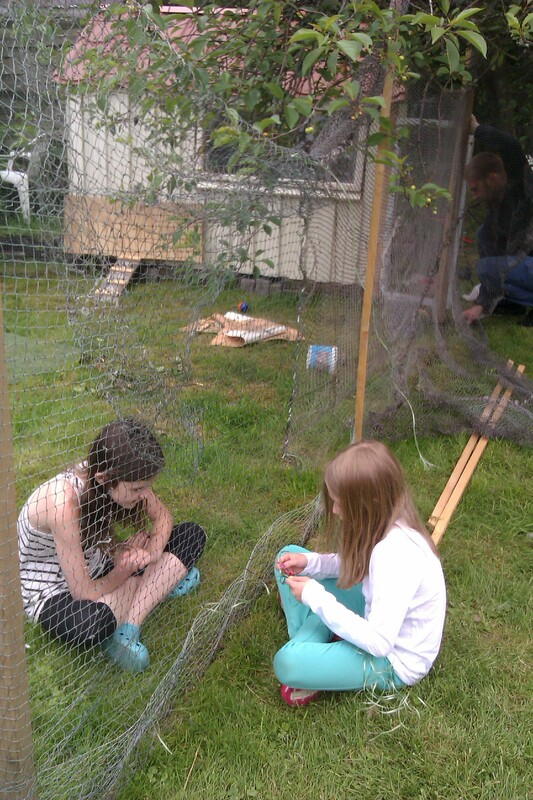 With some teamwork and child labour we got the nets in place and the chickens got to go outside! 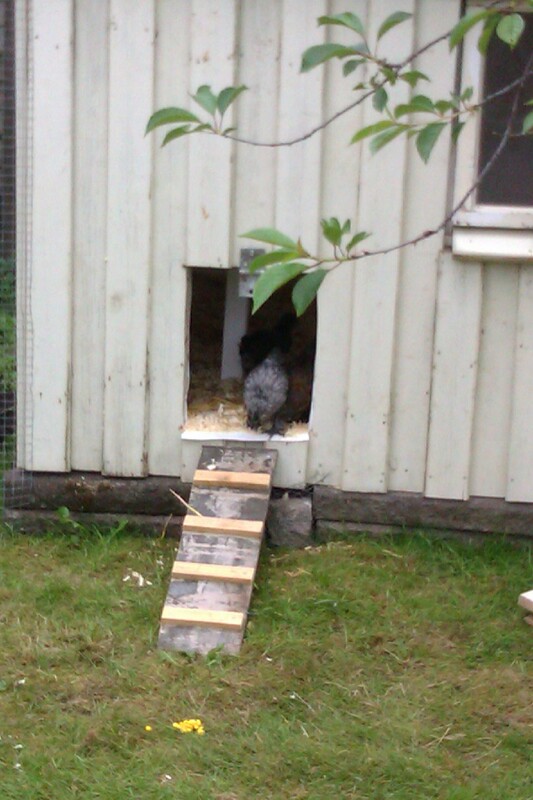 They hesitated for long but tempting with corn and a lot of pushing around between them, Ninja fell out of the hatch. It started raining pretty soon but I’m sure if the weather picks up they will venture out further next time. 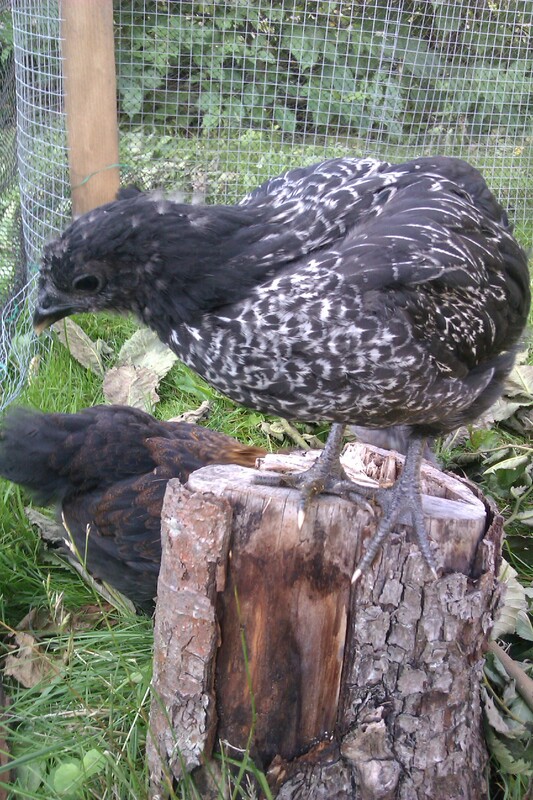 So far they don’t use the sticks unless you put them there, a bit high up but it won’t be long before they can jump up there. At first they where quietly curious but after a while they started going nuts! 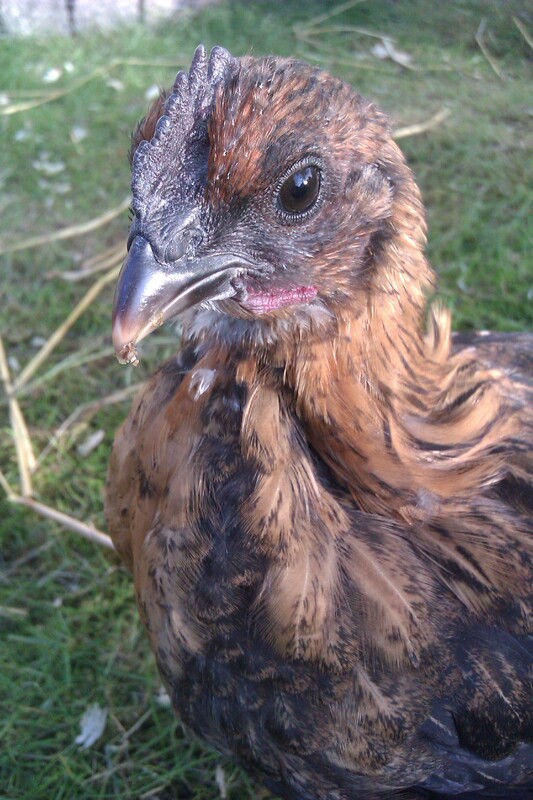 I thought Sookie had broken a foot or wing she was crawling around on her side trying to dig herself under the wood-cuttings. After a little while everyone was doing it and then they fell asleep under the lamp like tired toddlers.